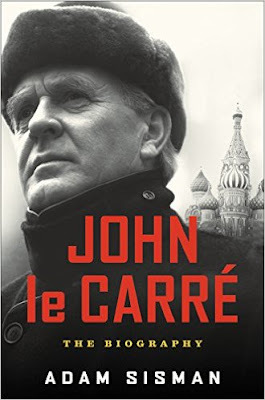 My review of Adam Sisman's biography of John le Carre appears in the Washington Times today. John le Carre, 84, aka David Cornwell, is a spy novelist who has received critical acclaim as well as commercial success since 1964 when he published “The Spy Who Came in from the Cold.” The former British intelligence officer has published 21 espionage novels, including the Cold War classic, “Tinker, Tailor, Soldier, Spy,” which was made into a fine BBC TV seven-part series that starred the late, great Alec Guinness as George Smiley. Mr. le Carre has led an interesting life, as we learn from the biography. Born in 1931 in Poole, England, he had an unhappy childhood. His father Ronnie was a notorious con man who served time in prison for fraud, and his mother deserted the family when Mr. le Carre was only five. His motherless childhood and his ambivalent feelings toward his crooked father have influenced nearly all of his fiction, especially “A Perfect Spy,” which Mr. Sisman says is Mr. le Carre’s most autobiographical novel. ... I’ve been a reader and admirer of Mr. le Carre since the 1960s, although I don’t subscribe to his leftist views and his anti-Americanism. His later novels are not as good as his earlier ones, in my view, as they are marred by his political shrillness. Yet I continue to read Mr. le Carre because he is, after all, a fine writer. Great review, Paul. I share your frustration with the focus; it seems that the Cornwall's life as a novelist is less interesting than his life within the intel service, and focusing on the latter rather than the former would make for a more compelling biography. So, while I think your review is well done, I think I will take a pass on the biography.